This is a report worth reading one and all! This appeared in Popular Science.. Here is a small extract! A glacier that accelerates with a warming atmosphere is within the realm of scien-tific expectation. But according to the conventional wisdom of glaciology, the massive ice sheets that cover most of Greenland and Antarctica should respond much more slowly to variations in temperature, with appreciable changes happening across hundreds and thousands of years. Yet Steffen's ground-based instruments and satellite data were showing that the ice under Swiss Camp was accelerating as temperatures rose, flowing at speeds of up to 20 inches a day as ice melted in places where it had once stood solid. Seismographs picked up increasingly frequent ice quakes, as the 5,000-foot-thick ice cap lurched toward the sea. By 2006, Greenland's ice sheet was shedding some 150 gigatons per year—a mass surpassing all the ice in the Alps. "We realized that something was going wrong," Steffen says. 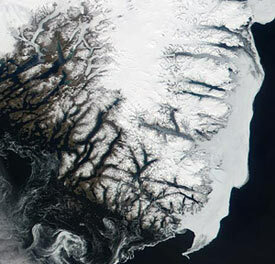 "Greenland was coming apart." Dwindling Snow Cone Konrad Steffen's work has shown that the extent of snowmelt in Greenland increased drastically between 1992 and 2005. Some frozen areas of Greenland have always melted each summer, but as global temperatures rise, Steffen's instruments have detected melting at higher elevations and latitudes. Instead of liquefying merely around the southern and eastern edges of Greenland, the ice pack is melting farther north and farther inland than before. Some scientists believe that large amounts of Greenland's melted freshwater could dilute the salinated water of the Gulf Stream, disrupting the movement of the North Atlantic waters that regulate weather in Europe. We have included other articles connected to this situation re CO2 and methane see methane subject for more and the possible sudden intake of CO2 that could happen through the increased release of methane into the atmosphere. Read full file report here! Now this one in 2005. 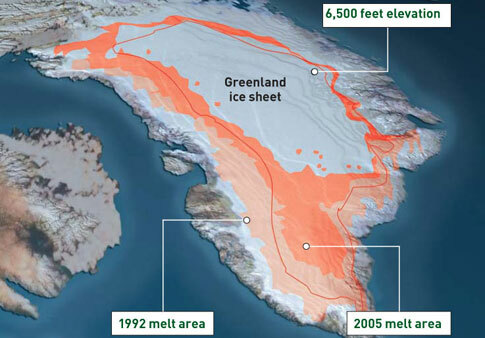 Nasa scientists have warned that global warming is affecting Greenland's entire ice sheet as well as its glaciers. Greenland's fate is seen as crucial to the future of the world's sea levels.